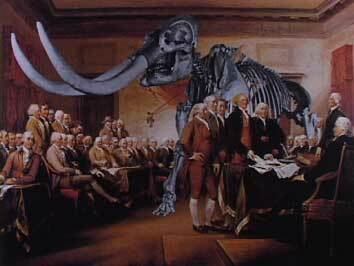 The untold story of the founding fathers' fascination with the nation's first prehistoric monster is the subject of an educational video being prepared by author Paul Semonin. From the discovery of a giant tooth on the banks of the Hudson River in 1705 until the excavation of a complete skeleton in 1801, the mastodon's story spans nearly a century of speculation in Europe and America about the mysterious animal's identity. The documentary's central characters are all quintessential figures in American history, from the Puritan clergymen Cotton Mather and Edward Taylor, who first wrote about the giant tooth, to Benjamin Franklin, Ezra Stiles, George Washington, Thomas Jefferson and many others who collected the bones and made the animal a symbol of national identity during and after the American Revolution. Kentucky pioneers like Daniel Boone, George Rogers Clark and John Filson were all involved in the collection of specimens and speculation about the great beast's identity. Chalres Willson Peale's excavation of the first complete skeleton and its exhibition at his Philadelphia Museum provide the setting for the climax of the mastodon's story. Drawing upon a rich reservoir of archival images, including anatomical drawings, paintings, maps, and prints, as well as museum specimens and historical sites, the documentary will tell the mastodon's story through a mixture of voice over narration and excerpts from letters, diaries and writings of historical figures. The goal will be to recreate the sense of wonder, puzzlement and discovery that the Founding Fathers experienced in an era when there was little awareness of geological time and extinct creatures. At present the documentary is designed primarily as an educational video. A shorter version will be offered to natural history museums and historical parks with a special interest in the topic. Paul Semonin, author of American Monster, is the project's artistic director and script writer. The documentary will be narrated by James Earl, who teaches in the Department of English at the University of Oregon. beast or fish had such a tooth. taller than the pine trees.